As autumn closes in, the cooler days and longer nights beg for warm soups, stews and a rich glass of red. But what if the bottle remains unfinished? What if you've splurged, and it's a really good bottle? This about vino sustainability, not dumping or swilling. According to Decanter magazine, the Private Preserve gas cylinder is the absolute best way to keep an open bottle of wine fresh. There's only two ways to preserve an open bottle. 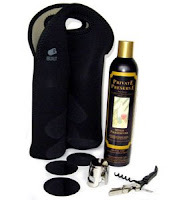 You can either put something in the neck of the bottle to prevent oxygen from getting into the wine (doesn't help with the oxygen already in the bottle), or you can remove as much oxygen from the bottle as possible with a vacuum or inert gas, the latter of which displaces the oxygen and creates a protective blanket over the surface of the wine. The vacuum process doesn't guarantee all the oxygen will be removed and is considered somewhat of a violent process as the wine's desirable aromas can also get sucked out. 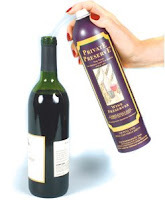 In a limited trial of three vacuum-style stoppers, two inert gas systems, plus the bottle's original stopper on three contrasting wines, it became clear by the fourth day that the Private Preserve gas kept the wine fresher for longer. A couple of squirts into your bottle followed by re-corking with the bottle's original cork and you can enjoy your wine up to a few weeks later, says Anthony Gismondi, one of Canada's leading wine critics and editor of gismondionwine.com. "Gas is the best way to go," he says. "It's so much simpler to use than pumping a vacuum - and more effective." "One can of Private Preserve will last a good few months for the average consumer," said Gismondi. Private Preserve is available at Lavish & Lime in single cans or as part of our Wine Essentials Kit - Wine 101 in a neoprene bottle bag - the perfect gift for anyone who enjoys wine. View the video below to learn more about our wine kit and for a Private Preserve demo, presented by Anthony Gismondi.